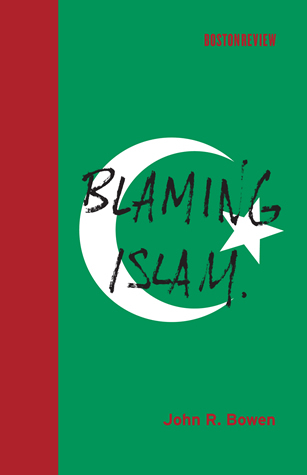 Blaming Islam by John R. Bowen. Publisher: The MIT Press (April, 2012). Non-fiction. cloth. 112 pages. 978-0-262-01758-9. The title and cover immediately drew me to this little book. Islam remains a mystery to many of us in the Western world. Where does the line blur between Muslim immigrants and Islamic extremism? Is this a multi-cultural issue or an issue of assimilation? Author John R. Bowen attempts to answer some of these questions while also raising new ones. There’s a chapter on Sharia law. He’s well-steeped in the topic. He mainly focuses on Europe and right-wing parties with their swiftness to blame Islam for the wrongs in society. In what I consider to be quite brilliant, France requires its free French courses as part of an “integration contract” and Germany provides free German lessons to those granted work visas. Surely that helps to connect people. Blaming Islam is a brainy and stimulating read. This entry was posted on April 26, 2012, 01:49 and is filed under Books. You can follow any responses to this entry through RSS 2.0. Both comments and pings are currently closed.